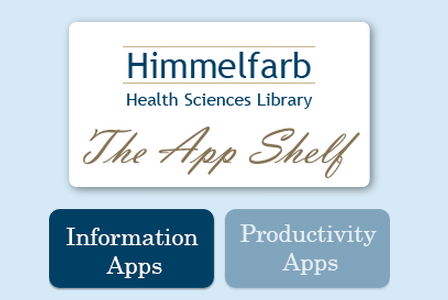 Clinical and productivity apps are available via Himmelfarb Library. Check out the apps available on Himmelfarb Library's App Shelf to download each app and find instructions for connecting the app to Himmelfarb Library's subscription. Health Information @ Himmelfarb locates resources from the library’s online and print collections to provide you seamless access to Himmelfarb Library’s resources. Health Information @ Himmelfarb provides extensive access to full-text online materials and can also help you identify useful print materials. The Health Information @ Himmelfarb search box is located on the Himmelfarb Library home page. Include's Himmelfarb's full-text links and filters. Interdisciplinary database; recommended for public health research. Authoritative coverage of nursing and allied health literature; recommended for nursing. Full-text clinical and basic sciences textbook collection that includes Harrison's Online, Tintinalli's Emergency Medicine, Current Medical Diagnosis and Treatment, Hurst's The Heart, Goodman & Gilman's The Pharmacological Basis of Therapeutics, and the Lange educational library series. Clinical information tool searches extensive full-text holdings for clinical answers in journal articles, books, and videos.